Whilst recovering from my operation, stuck with a severe case of ‘what the hell do I do now’, my lovely friend brought a gigantic pile of books (mostly Stephen King, perfect for October) for me to read, because literature heals everything. Amongst the pile was Fangirl by Rainbow Rowell – very very different to the likes of Carrie and Misery. Admittedly, I was a little skeptical at first as to whether or not I’d actually like/relate to Fangirl, having never read fanfiction. My skepticism was completely ill-founded, however, and I loved it. Characters – There aren’t many characters in Fangirl, and most of them have a vital role to play in the story. At first, I found it difficult to like Cath due to her (in my opinion) negative outlook and harsh judgement of others. As the book went on though, I began to understand her a little more, and actually found aspects of her personality incredibly relatable. Besides that, I loved that Rowell created characters with realistic flaws and such a variety of personalities, rather than a stereotypical cast of cookie cutter young adults. Cover – I’m a sucker for a simple cover without a picture of real people on it (anyone else?). The illustrations are super cute, too. Writing Style – It seriously just feels like you’re in Cath’s head, Rowell‘s writing style is so laidback and makes easy reading, kind of John Green-esque. Every emotion Cath feels, you feel too, you don’t have any choice. Sometimes, it’s nice to read a book that gets straight to the point. Plot – In terms of storyline, I had no idea what to expect from this book. Rowell prevented the book from becoming too cliché by straying from the usual ‘quiet girl goes to college/uni, super popular hot guy secretly likes her, quiet girls gets makeover and personality overhaul, quiet girl and popular guy get together, they all live happily ever after’ which made a nice change. I also loved that the author drew attention to certain character’s mental health, as this is something that we need to be more open about in our society. It’s definitely not a complex book, so you know how it will end, but you still find yourself routing for Cath regardless. 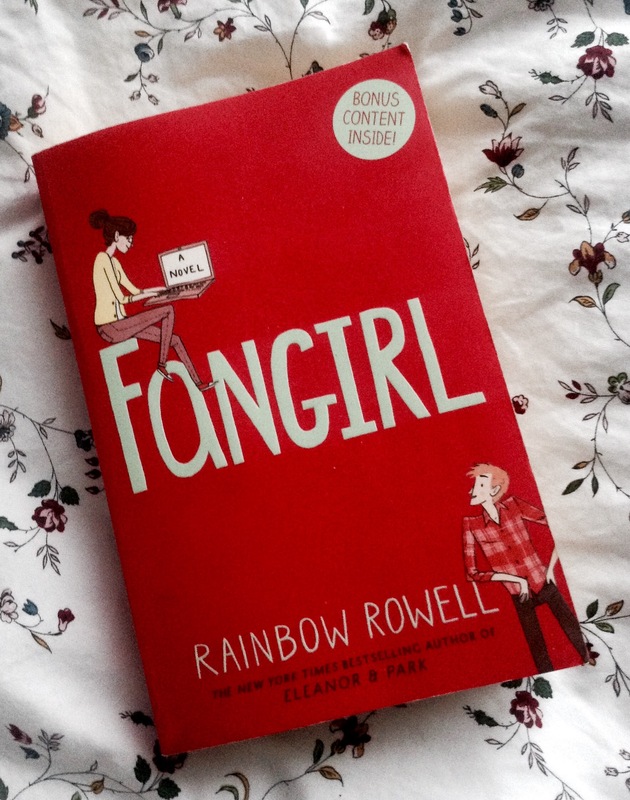 Overall – Fangirl didn’t exactly change my life or make me realise anything, and I doubt I will read it again, but I did really enjoy it. This book was definitely aimed at young introverts, like myself, so many aspects of the book were incredibly relatable. I’ll definitely be reading more from Rainbow Rowell (hello Eleanor and Park) in the future! That concludes my first (and hopefully not last) ever book review on ElizaBelle! How do people do these without revealing everything?! If you’ve not read the book, then scroll further at your own risk as there are SPOILERS AHEAD, as well as a few questions for people that have read the book. Did you expect Cath and Levi to end up together? Or did you think (or even want) that Cath and Nick might end up together? Did you think that Cath’s dad and the way in which she worries and cares for him was realistic? I also really want to address the fact that Cath and Wren’s Mum, Laura, left them. I loved this (hear me out, I’m not a complete sadist I swear) for two reasons: the first one being that authors normally write about a dad that’s left as this is more common/commonly talked about (please correct me if I’m wrong). The second reason being that when a main character has a parent(s) who leave/die, this tragic event becomes a motive/driving force/main focus/depressing thing that is continually adressed by characters even when it’s not that relevant (think Batman, Harry Potter and James Bond*). I do realise that this sort of thing makes you empathise with the protagonist more and adds a bit of drama, but Rowell writes it in differently – there are moments where we see Cath upset or angry that her mum left, and it is discussed between characters, yet it doesn’t become this heavy sad fact that looms over the entire novel and dictate Cath’s every decision. I love that there is some humour surrounding it too, like when Cath says “I wonder if I’m going to get swoony around middle aged women until I am one” – which may sound a little odd to those of you who haven’t had a mother leave/pass away, but to those of us that have, it’s quite funny and weirdly authentic. Anyway, let me know in the comments what you loved (or hated, if it’s not your thing) most about Fangirl, and what your favourite quote was! If you are a fan of Cath & Levi as a couple, they make a cameo in Landline! Great review! I’m reading it right now and I quite like it! great review, enjoyed my read. Who was your favourite character and why? – Levi. Oh gosh. Did you expect Cath and Levi to end up together? Or did you think (or even want) that Cath and Nick might end up together? – I thought cath and nick would end up together. I’m so glad they didn’t as he was only using catch for his own ends. Did you think that Cath’s dad and the way in which she worries and cares for him was realistic? – yes. There’s so many young carers out there. I thought Cath’s mom was pretty horrible though. Glad you enjoyed it✨ Levi’s hard not to love, and I completely agree about Cath and Nick! I loved the representation of young carers, and yes Cath’s mum was pretty awful .